Taken 1/3/1964 at Echuca, Victoria. As Echuca is a Heritage Site on the Murray River there is a reasonable chance that both these might have been preserved. Unidentified steam roller with s Super Sentinal Steam Wagon. I have a suspicion that both of these are now part of Museum Victoria's Collection at Science Works in Spotswood. Added by Piers Jackson on 13 July 2014. This Super Sentinel is number 5227. 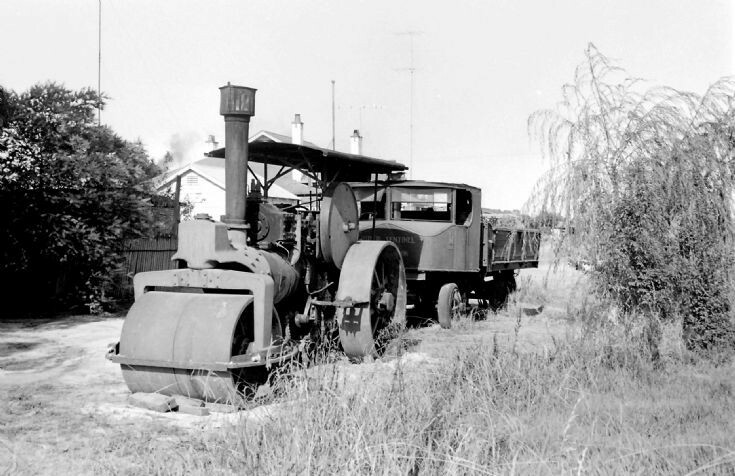 It was owned at the time the picture was taken by Stan Hazleman of Echuca. It is now in private ownership. Added by Claudia on 06 January 2019.